This is the signature overdrive pedal for Zakk Wylde, and sports a peculiar black and white bullseye drawing favoured from the guy himself. I personally think this is a good overdrive, however you shouldn’t think that putting this between your guitar and a bad amp will give you the same sound A *good* tube head is mandatory. 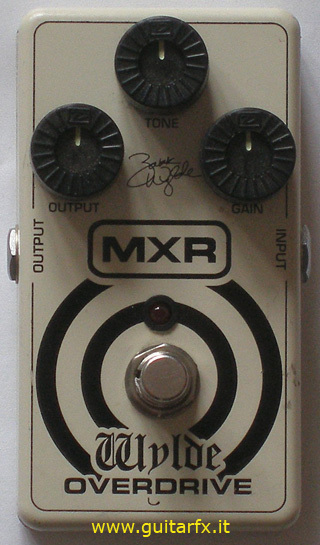 The build quality is usual MXR: compact size, solid metal and built to last. Notice the rubber covers on the pot knobs: I’ve been told that should allow turning the pots using your feet, but I’m still thinking it was a joke . One thing I don’t like is that you have to remove the 4 screws on the bottom plate to replace the battery.